On November 1st and 2nd, the barrier between the living and the dead dissipates and allows the souls of the dearly departed to commune with their loved ones. It is traditional for families to set up ofrendas in their homes or at the gravesites of their dead. The ofrenda (literally, "offering") is similar to an alter and may hold religious objects, photographs of deceased friends and/or family members, candles, favorites foods and beverages, marigolds (cempasuchil), pan de muertos (bread of the dead), candy skeletons, sugar skulls, and even bottles of tequila, beer, cigarettes and cigars! These familiar items, along with the smells of their favorite foods, are meant to guide the spirits home. Rather than mourning loved ones, Day of the Dead is an opportunity to honor, celebrate, and remember the lives of those who have crossed over to the Other Side. The Sugar Skull Gallery focuses on sugar skull masks but also contains pictures of three-dimensional sugar skulls I created over the past few years. Enjoy! 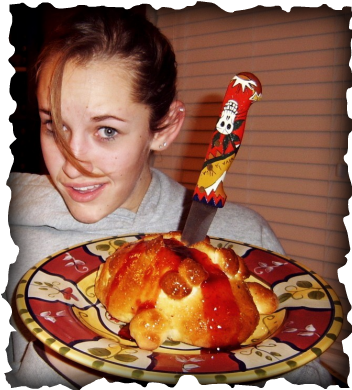 My daughter, Robin, and our homemade Pan de Muertos...Yummmm!